It may be cold and snowy here in New England, but down in sunny Florida, Spring Training has already begun – which means baseball season is on it’s way! The Red Sox are looking good, although they got pounded by the Orioles in the game I watched this afternoon (I’m writing this on a Saturday), but just hearing the crack of the bats has whetted my appetite for the return of America’s National Pastime. 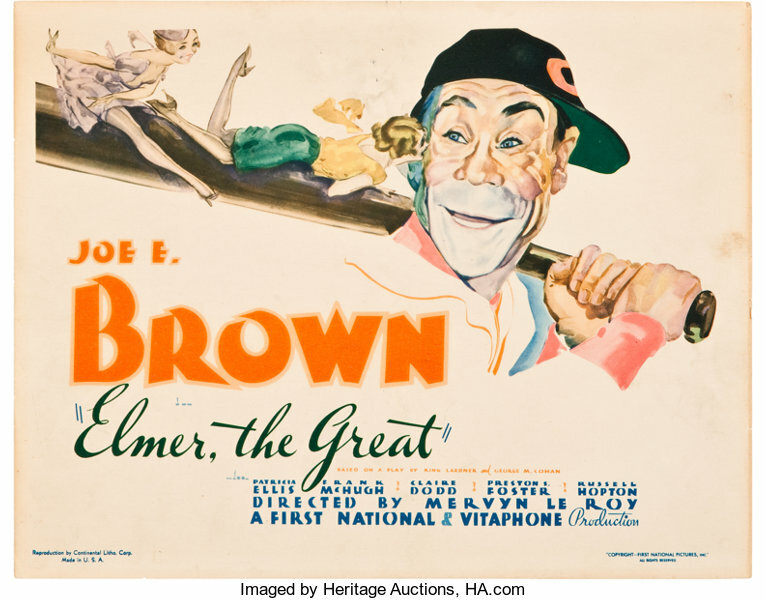 So while we wait for Opening Day to arrive, let’s take a look at the 1933 baseball comedy ELMER THE GREAT. 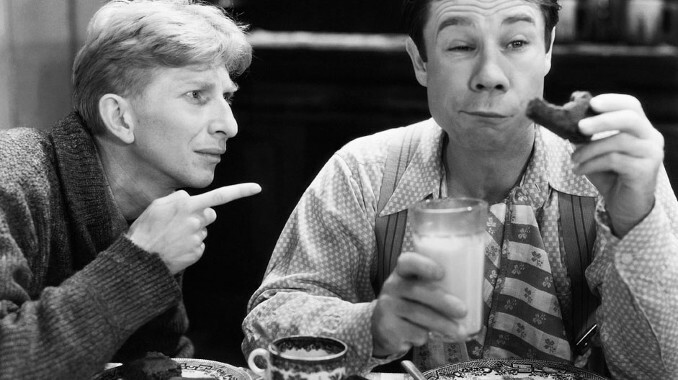 Comedian Joe E. Brown plays yet another amiable country bumpkin, this time Elmer Kane of small town Gentryville, Indiana. Elmer’s laid back to the point of inertia, except when he’s eating… or on a baseball field! He’s better than Babe Ruth and he knows it, and so do the Chicago Cubs, who’ve bought his contract from minor league Terre Haute and want him to be their starting second baseman. But Elmer won’t leave his hick town, because he’s got a crush on his boss, pretty general store owner Nellie Poole. When Nellie finds out she’s holding him back, she reluctantly rejects him so he’ll sign the contract and be a success. Disheartened Elmer does, and he’s off to The Windy City. At training camp, Elmer the big-headed rube gets constantly ribbed by his teammates, but wows ’em at the plate with his hitting power. The season begins, and the Cubs go on a tear, with amazing Elmer belting “67 Home Runs”! Nellie, whose letters have been withheld by team management so Elmer won’t return to Gentryville, flies to Chicago for a visit, and catches Elmer kissing a big city gal! The misunderstanding makes Elmer miserable, so his teammate High-Hips tries to cheer him up by taking the hayseed to a swanky speakeasy/gambling joint. 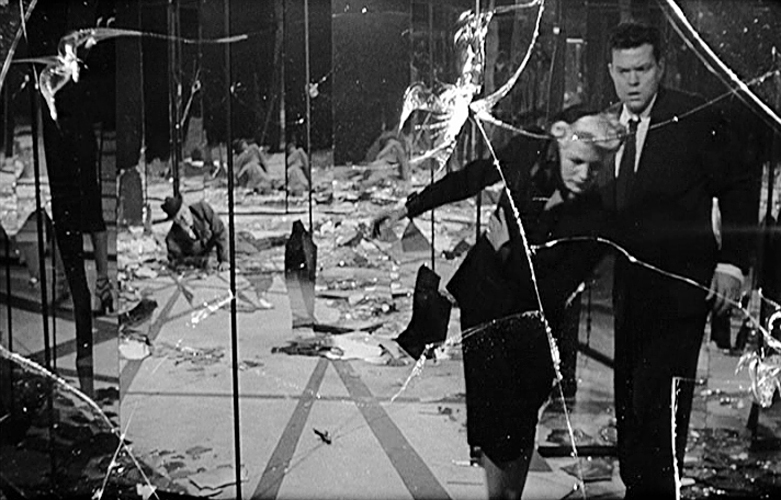 Elmer, thinking they’re playing for “funsies”, racks up a huge gambling debt, and the gangsters that run the joint tell him they’ll rip up the tab if he’ll do them a favor – throw the upcoming World Series against the hated New York Yankees!! 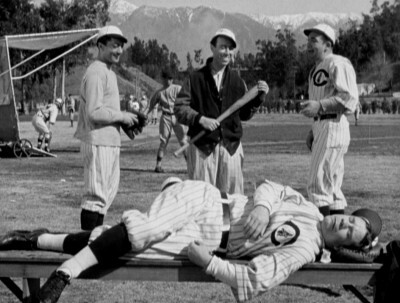 Brown’s early 30’s sports comedies are always entertaining, and ELMER THE GREAT is among his best. The screenplay by Tom Geraghty, based on a play by Ring Lardner and George M. Cohan, allows the comic to show off his knack for getting laughs both physically and verbally. He also gets to use that “Big Mouth” of his to good advantage early in the film. Brown’s ably supported by charmingly cute Patricia Ellis as Nellie, Frank McHugh as High-Hips, Sterling Holloway as his kid brother, and Familiar Faces like Berton Churchill, Claire Dodd , Douglas Dumbrille , Emma Dunn, Preston Foster, Russell Hopton, J. Carrol Naish , and Jessie Ralph. And believe it or not, that’s Lucille Ball’s TV nemesis Gale Gordon as the (very) young radio play-by-play announcer! 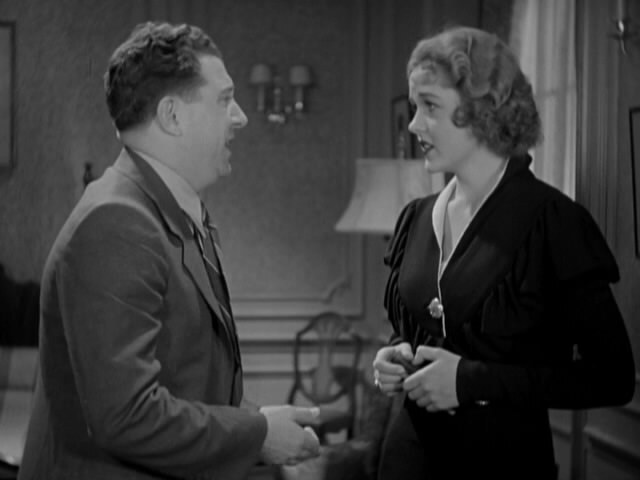 ELMER THE GREAT was the fourth and final collaboration between Brown and director Mervyn LeRoy , who also guided him in TOP SPEED, LOCAL BOY MAKES GOOD and BROADMINDED. It’s a funny little baseball comedy, and best of all (*SPOILER ALERT*), Elmer helps his team rally to BEAT THE YANKEES! Now that’s what a die-hard Red Sox fan like me calls a happy ending! 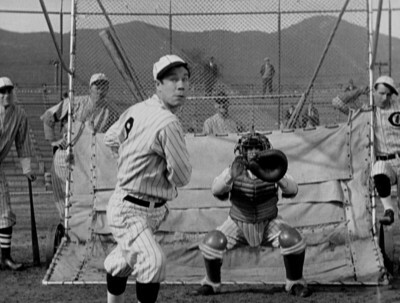 Baseball and Joe E. Brown. Can there be a better combination in a movie? I think not. Previous PostPrevious Celebrate Mardi Gras with Louis Armstrong!